Pueblo ladders are an integral part of Southwestern design. Their history spans hundreds of years, beginning in the ancient pueblos of Native American groups like the Zuni and Aztecs and continuing into modern architecture in the Pueblo Revival Architecture movement that, according to Dr. Tom Paradis, a professor at Northern Arizona University, started in the early 1900s and is still popular in the Southwest in the Twenty-first century. These pine ladders are simply constructed, but bring a touch of Native American culture to any decor. 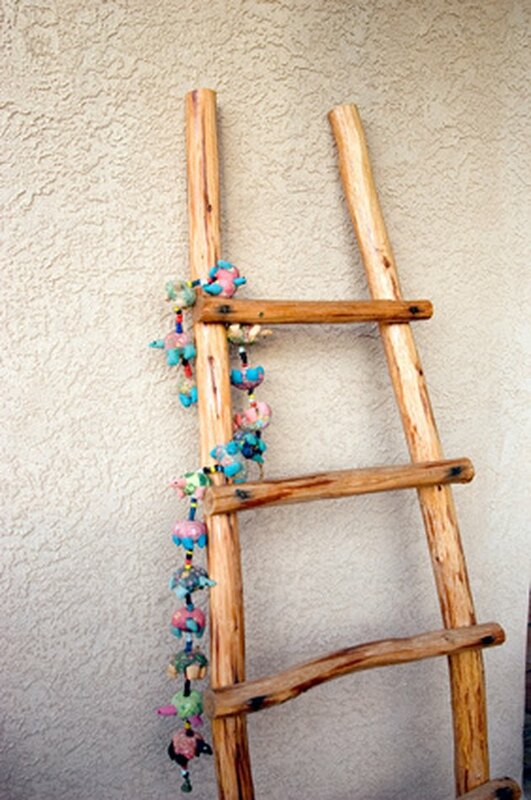 Pueblo ladders bring the Southwest into any decor. Scrape the bark off the 10-foot pine logs using a wood scraper until they are free of bark, then sand each piece until it is smooth. Apply water-repelling stain to the logs with a paint sprayer or by hand with a paintbrush, following the manufacturer's directions on the number of coats and drying times. Measure 12-inch sections with the tape measure and mark each section on both of the frame logs with a pencil. These are the spots where the rungs will attach to the frame. Cut notches at each mark in the front of the logs, using either a miter blade on a table saw or a jigsaw. Each notch should be wide enough that the rungs fit snugly into the notch. Fit each rung into place, and turn the ladder over so you can access the back of it. If the rungs do not stay in place, apply wood glue to the frame before fitting the rungs. Let the glue dry before turning the ladder over. Predrill holes in the back of the ladder where the rungs are attached to the frame. Screw the 3-inch screws through the frame and into the rungs to secure them into place. Turn the ladder back over. Cut the rawhide lashing or leather thong into sixteen equal lengths of 12 inches, using scissors. Wrap one piece of lashing around the frame and a rung in an X pattern. Tie off the lashing at the back of the ladder, where the loose ends will not be seen. Cut off extra lashing. Repeat this step on each rung. Based in Farmington, N.M., DelSheree Gladden has been a contributing writer on eHow.com since 2008. Her primary topics of interest include yoga, dance and gymnastics, the field in which she currently works as a certified fitness intructor. DelSheree has an associate degree in English from San Juan College.